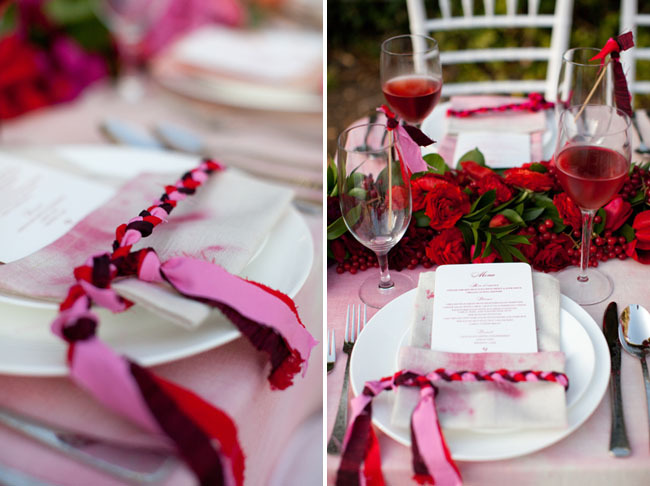 Love the braided fabric used with the menus and the hand dyed napkins + tablecloth. This is simply gorgeous. 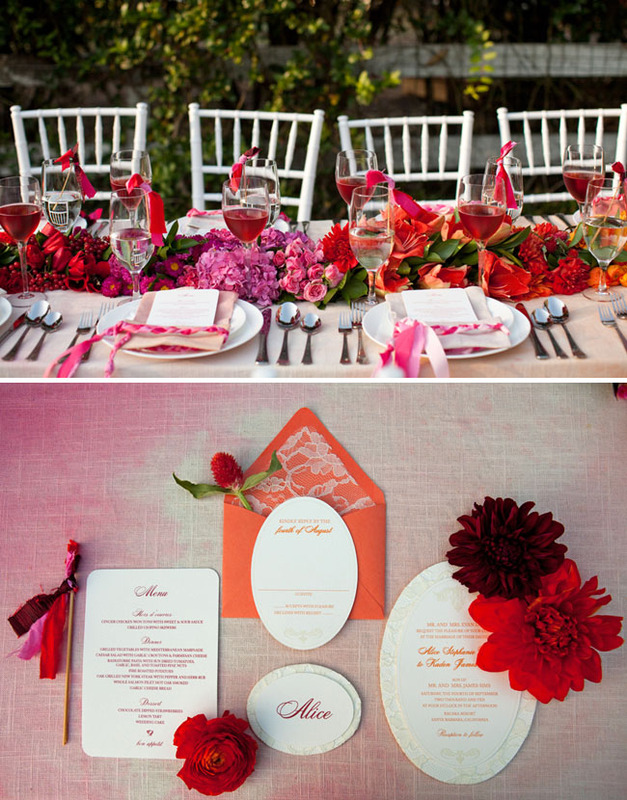 I love the braided fabric, the menus, the colors, love it all! What a fabulous shoot! Becky Hill’s work is beautiful. Beautiful feature, thank you Jen!! Oh I’m such a sucker for pink! How do people get their husbands to agree on all the pink? My husband wouldn’t go near pink. He may have been more involved than other grooms though. that umbrella idea is fantastical! This is one of my favorite shoots. 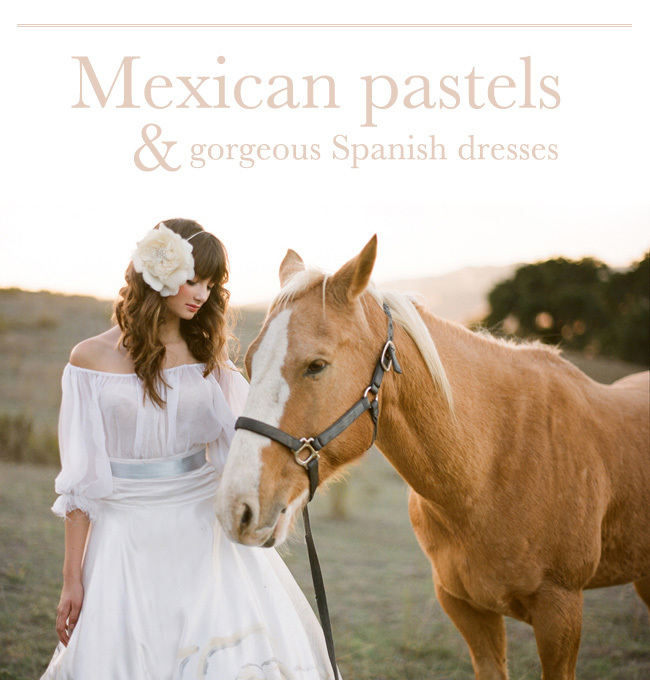 The dresses are beautiful. The lighting is great. 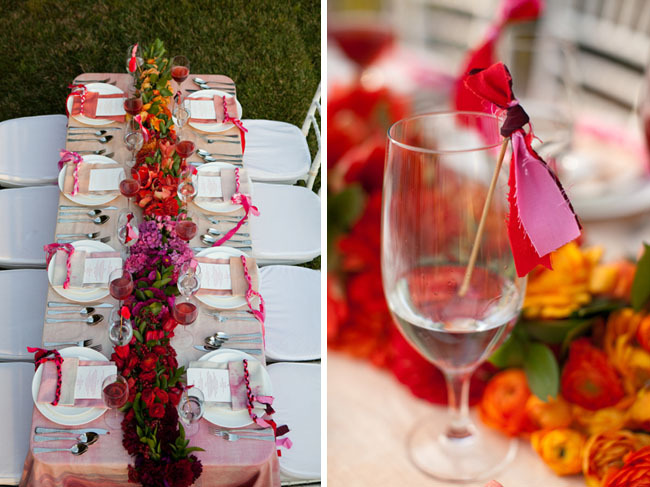 I love the tablescapes..a nice feminine touch. Becky Hill’s work is breathtaking! 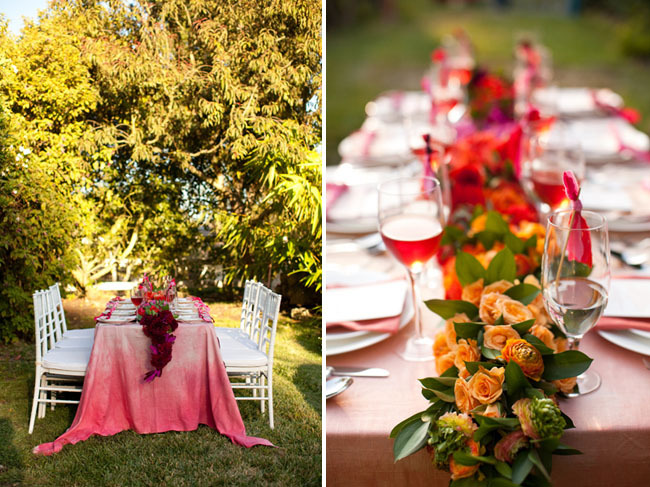 Amazing pictures and beautiful tables! Love the flowers! LOVE LOVE LOVE THE ALISA BENAY DRESSES!! SO BEAUTIFUL!! The table settings are beautiful. Such a wonderful idea with the braided fabric. Love the umbrella! That linen is fabulous! The drink flags and napkin braids are so cool! 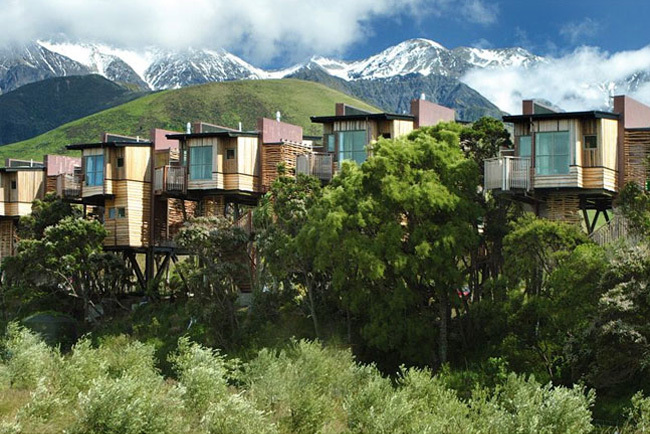 Canvas & Canopy – you’ve done it again! 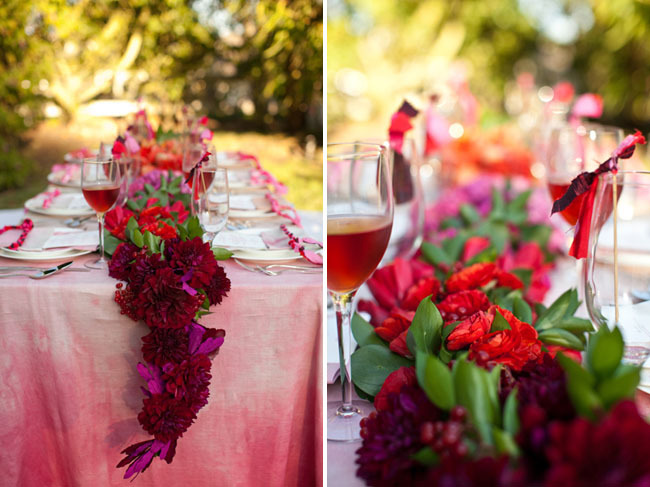 Brilliant work Cortnie– love the linens and the braided fabric napkin detail is super! Oh wow. I love those colors together– what a great shoot! I’m from Brazil and I’m inspiring in this blog for my wedding! Love the idea of a lace envelope liner! I’ve never seen that before, but it’s so simple and elegant. 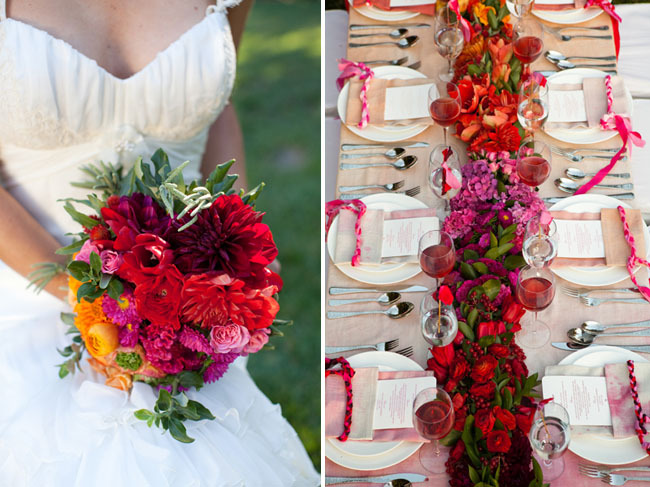 And yes, that floral table runner is absolutely amazing! Love the pretty and pink! Alisa Benay dress is gorgeous!!! Love it!!!! Wow those flowers are insane!!! And the braiding is pure genius!! That umbrella is so unique and fantastic! 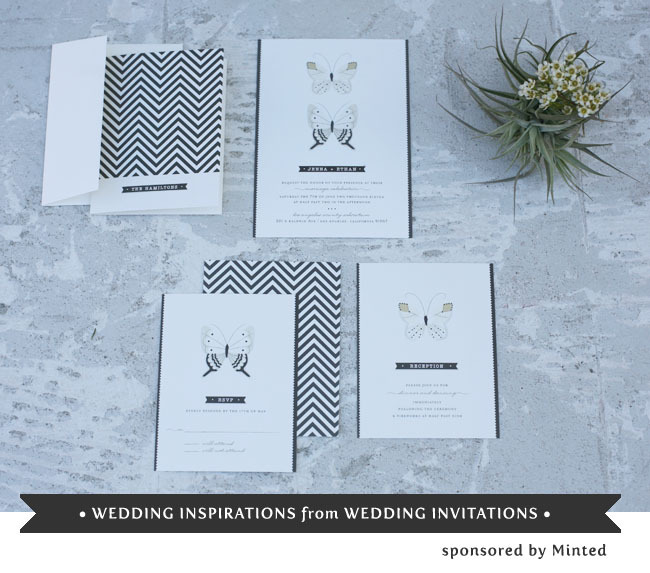 I love the monochromatic floral sections… so smart looking. BUT… I ADORE the umbrella! ADORE! I have been a reader of your site for some time now, though this is the first time I have posted a comment. I love the table arrangement, it seems like flowers are coming from everywhere, leaving the feel of a natural, organic experience. 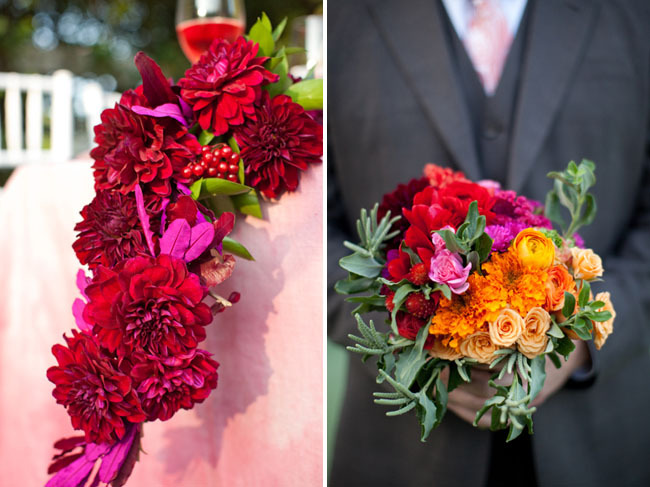 The colors of the flowers are great enhancers. The umbrella is an interesting novelty, but at some level your eyes are so drawn to it because of that same novelty, it can take away from the otherwise subtle, natural presentation. Of course, this primarily depends on one’s personal views of accessories. I personally, feel less is more, especially when the flowers seem near perfect. But certainly a wonderful presentation and I love the site. Incredible tablescape. 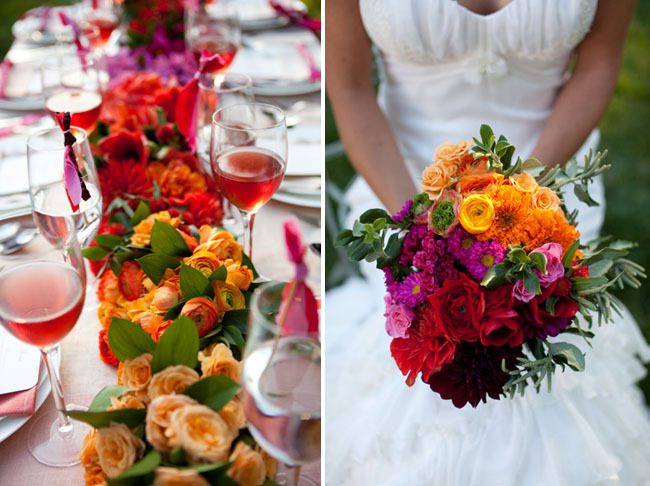 The undulating colors of the flowers running along the center of the table is fabulous. Gosh, the colours are beautiful. And those wedding invitations, spectacular. 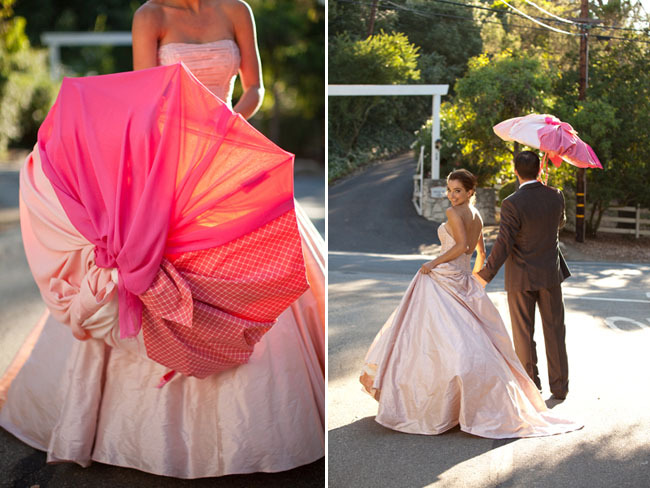 I especially loved the fabric umbrella, and oh the bride looked beautiful!!!! Oh my gosh, I would die for that umbrella!!! This is just super gorgeous in every way. I love the flowers and stationery! Wow! Martha Stewart and her team of stylists could not have done such a wonderful job! Congrats to the couple.